When you need a water softener installed contact M.A.C. Stewart Plumbing. We install water softeners. (705)7335154 Sales and service of water softeners. Most water softeners on the market operate on an “ion exchange” system. This is where hardness ions (calcium and magnesium) are exchanged for sodium (salt) or potassium (salt) ions. This takes place within the resin tank of the water softener. When water flows through the tank it comes in contact with small resin beads that are covered with sodium or potassium ions. As the water flows through the resin beads, the calcium and magnesium ions trade places with the sodium ions. That is why softened water becomes higher in salt content. Eventually as larger volumes of water is softened the beads become exhausted and contain nothing but calcium and magnesium, thus requiring recharge. That is why you need to put bags of salt in the brine tank. The brine tank is either beside the resin tank or is packaged together with the resin tank as a single unit. Recharging the mineral tank works exactly the same way as softening the water except in reverse. The calcium and magnesium again swap with sodium or potassium rich solution from the brine tank, and the excess minerals are rinsed into the wastewater drain. 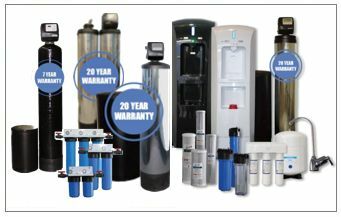 A “demand initiated regeneration” or DIR water softener is the most common ion exchange softener being sold locally. This system meters the water usage over time and only regenerates when needed. Some softeners operate on a timer or schedule that regenerates at set increments. This older technology can be very wasteful in terms of salt and water usage as the softener will regenerate even if it is not required due to low consumption in the home over a given time period. At the same time, these models could leave you short of soft water if you have higher consumption due to house guests, etc.